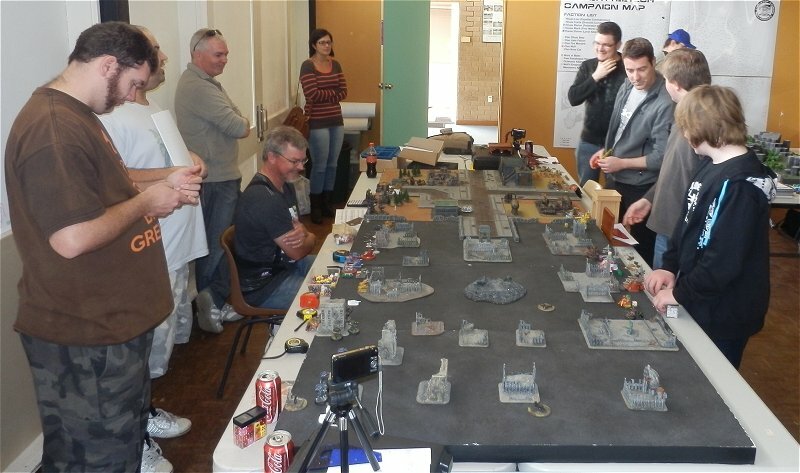 Board set-up and deployment. The Chaos Devestation Cruiser is coming on turn 1. 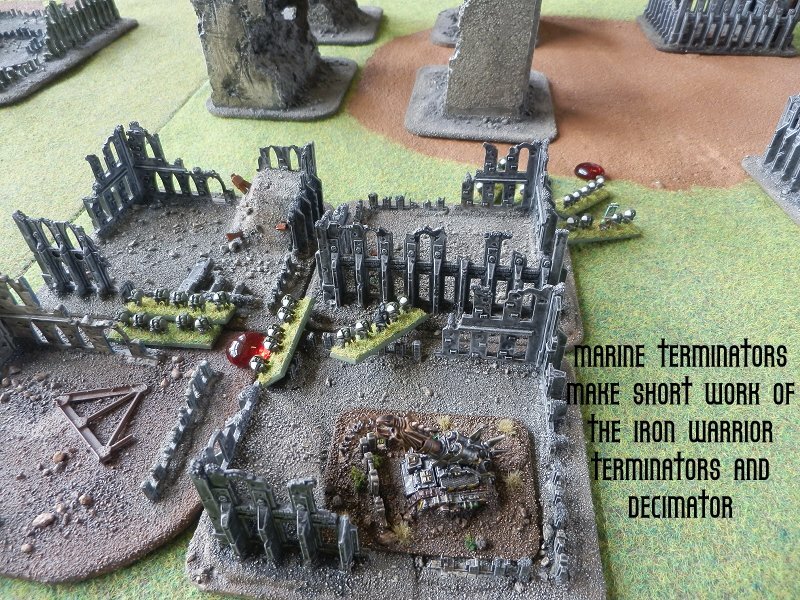 Iron Warriors teleport in the Obliterators near the Minervan Deathstrikes/Manticores and Salamanders. Strategy roll goes to the Minervans. 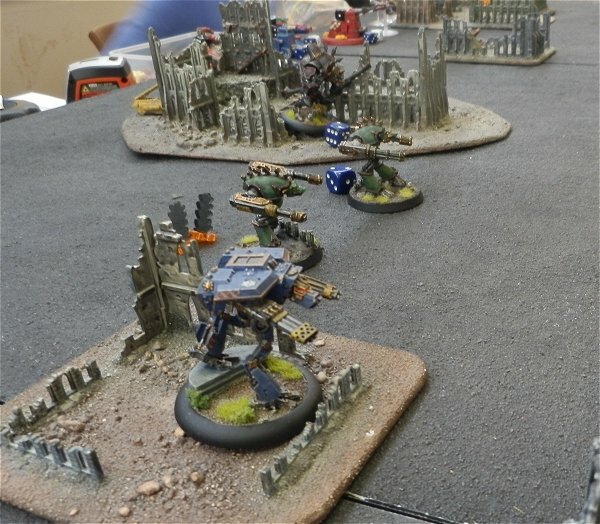 A Warhound advances on the Obliterators and kills one of them (even using the Plasma Blast Gun). 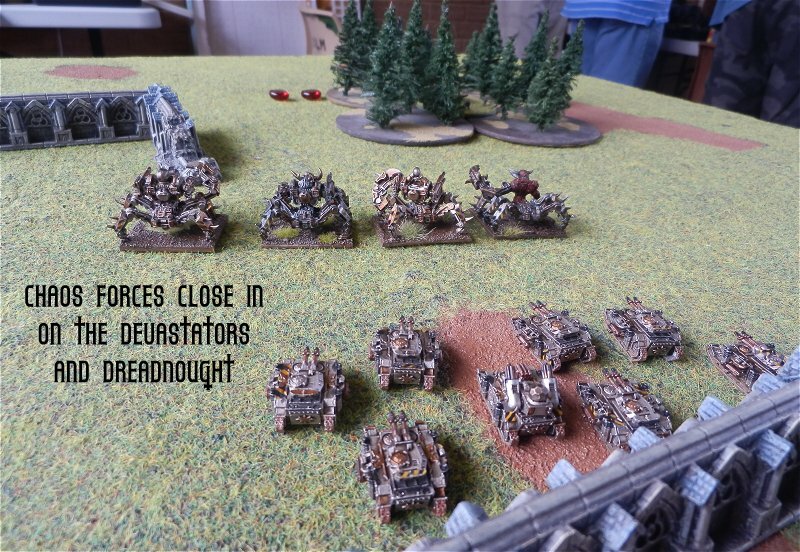 Fearful of the unbroken Obliterators, another Warhound attacks them and manages to kill one more, breaking them. The Chaos Cruiser activates and hits the Shadowsword with the pin-point attack (killing it on a critical). The orbital bombardment hits a Leman Russ Exterminator formation. Retaing, the Ordinatus sustains fire and hits both tank companies and a Warhhound. Thunderbolts dive down and attack the Ordinatus. One of them was shot out of the sky by the Ordinatus AA fire and the remaining TBolt took out 2 Void Shields. Iron Warrior Defilers march along their base line, heading nearer to the Minervan forces but staying out of Exterminator effective range. The Deathstrikes failed to activate (even with a re-roll) and fired a titan-killing missile on Defilers which missed. The Manticores were also fairly ineffective on turn 1. 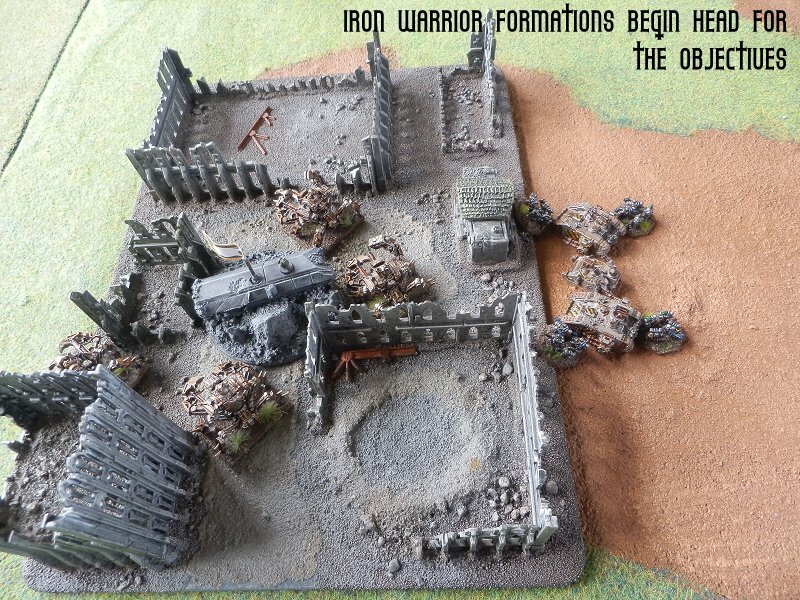 More of the Iron Warrior formations move along the base line to set themselves up for objectives in the following turns. The Minervan Salamanders had a few shots at the Broken Obliterators but caused no damage. 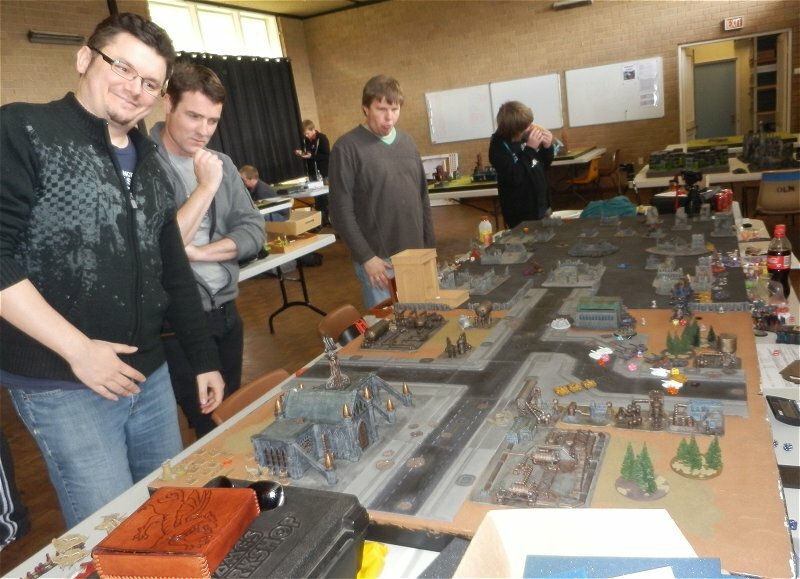 Exterminator tanks advanced towards the middle of the board. The remaining Imperial Warhound failed to activate and broke. The other Tank Company also failed to activate and cleared blast markers. 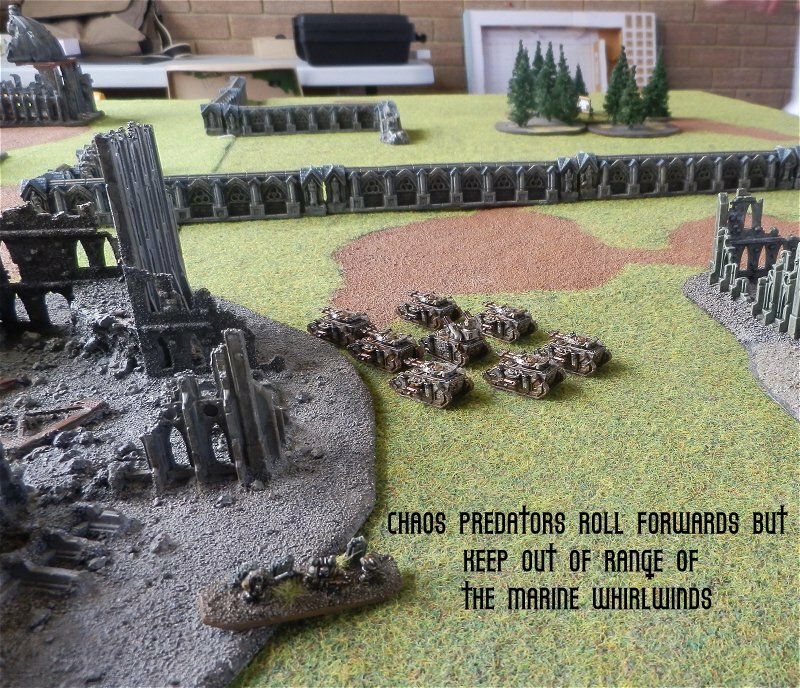 Chaos Predators, the Decimator and the last Defiler formation all headed for the middle/right side of the board. The remaining Thunderbolt is shot down exiting the table. A couple of the Minervan formation fail to clear all their blast markers. Strategy roll goes to the Iron Warriors. The Obliterators (who are in the Salamander’s zone of control) double through the scout screen (one failing a dangerous terrain test in the swamp) and place a blast marker on the Deathstrikes. Attempting to retain with the Ordinatus fails and it clears it’s blast marker. Warhounds again pour their Vulcan Mega Bolter rounds into the Obliterators and break them. The 2 remaining Obliterators head for the Minervan Blitz objective. 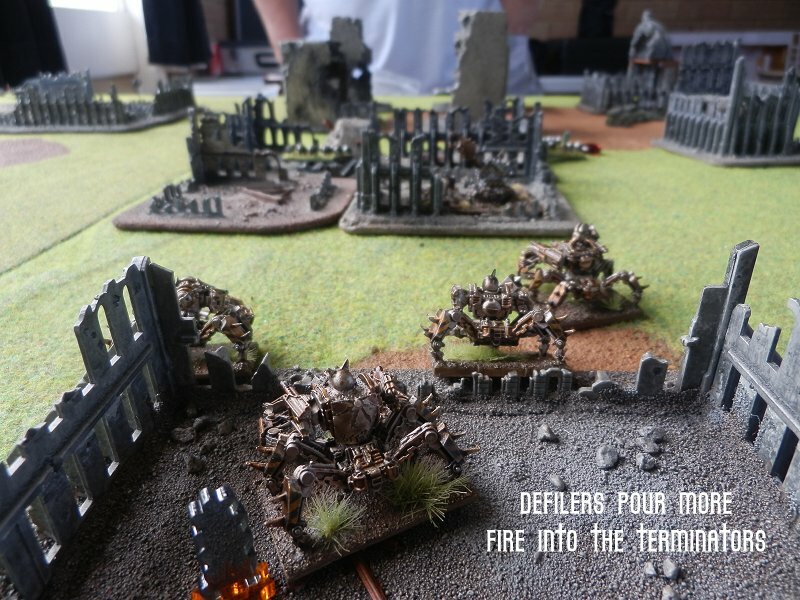 Defilers move through some ruins and fire on an Exterminator Tank Company, killing one tank. 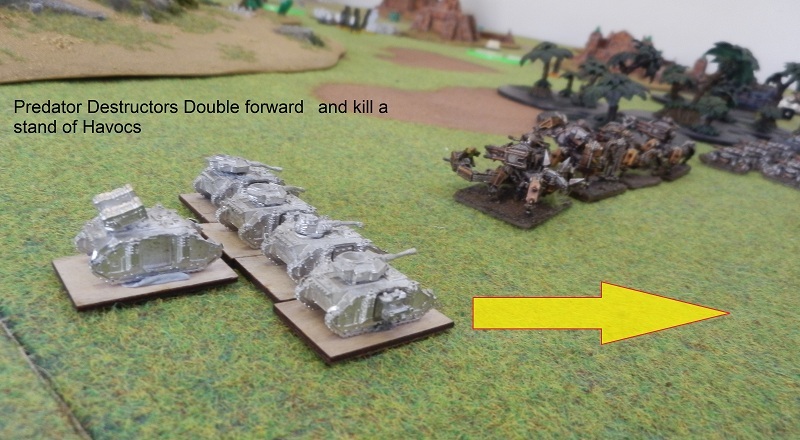 An Exterminator Tank Company fails to activate (for the second turn in a row) but rolls forwards towards objectives. The other Tank Company rolls forwards and takes a few long range shots, breaking the Chosen formation. Iron Warrior Predators advance on an un-activated Warhound and strip it’s shields and cause 1 DC damage. 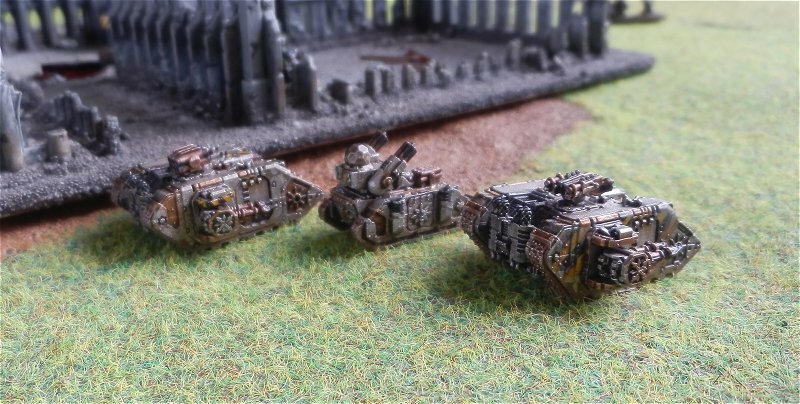 The Decimator super heavy tank follows up and breaks the Warhound which withdraws towards the Chaos Blitz objective and the Ordinatus. The Deathstrikes follow the Obliterators, trying to keep away from the Defilers. The Manticores are ineffective again. The Salamanders pull back to try and protect the Deathstikes from the Obliterators. The Iron Warrior Chosen formation remains broken and moves in the way of the advancing Minervans. The Obliterators also fail to rally. The rest of the Chaos forces rally. The broken Minervan Warhound fails to rally as does one of the Tank Companies. The rest rally. 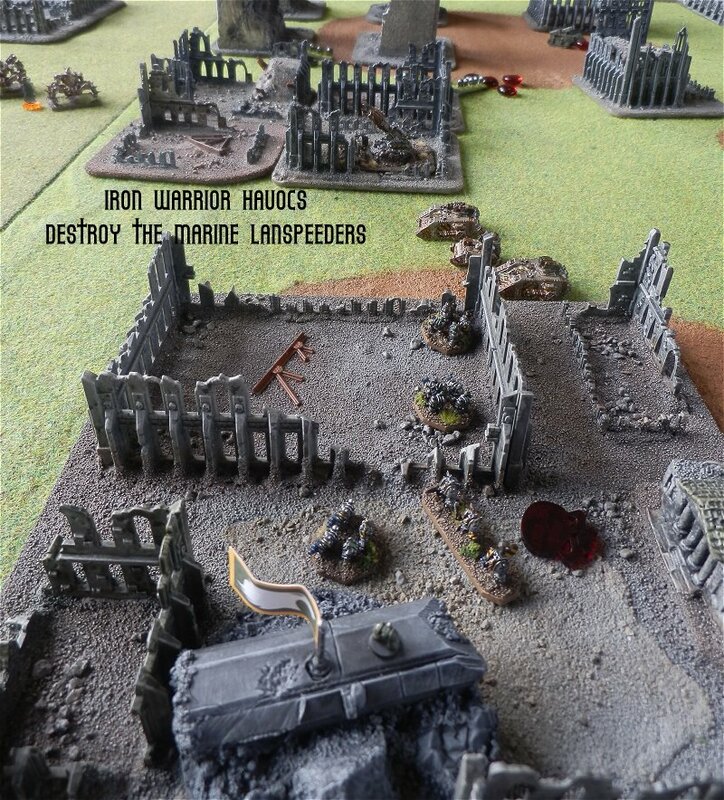 The Iron Warriors head for objectives and place as many blast markers on Imperial formations as possible. 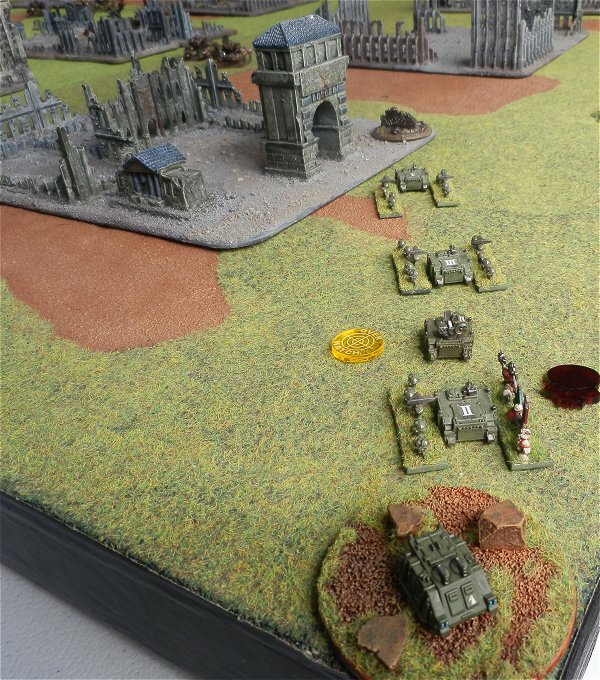 The Minervans do the same, placing a Tank Company near an objective on their side of the board and breaking a nearby Defiler Pack. 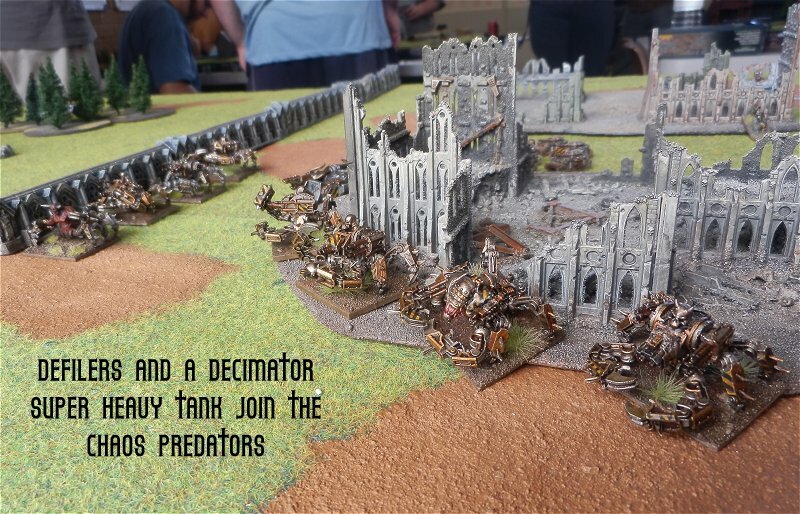 The Decimator heads for an objective and takes a long range shot at the Tank Company, killing one tank. 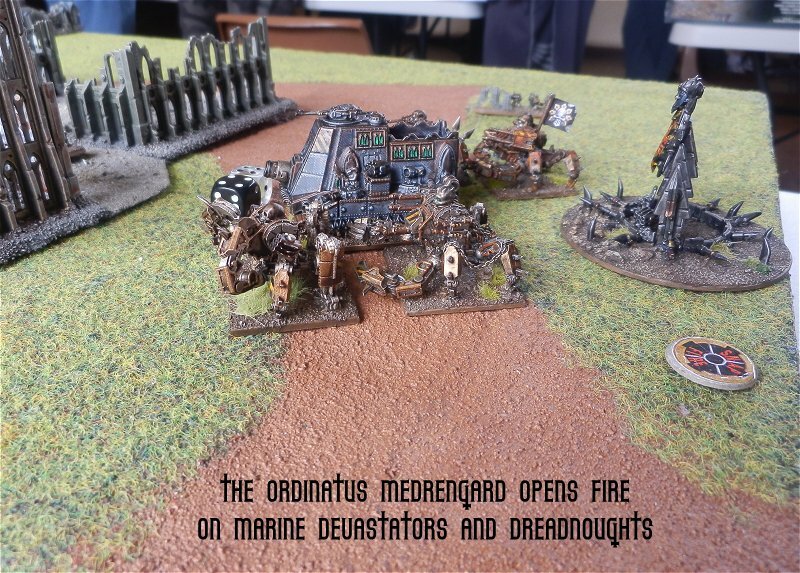 The Ordinatus opens fire and hits a Warhound. The broken Chosen formation is wiped out. 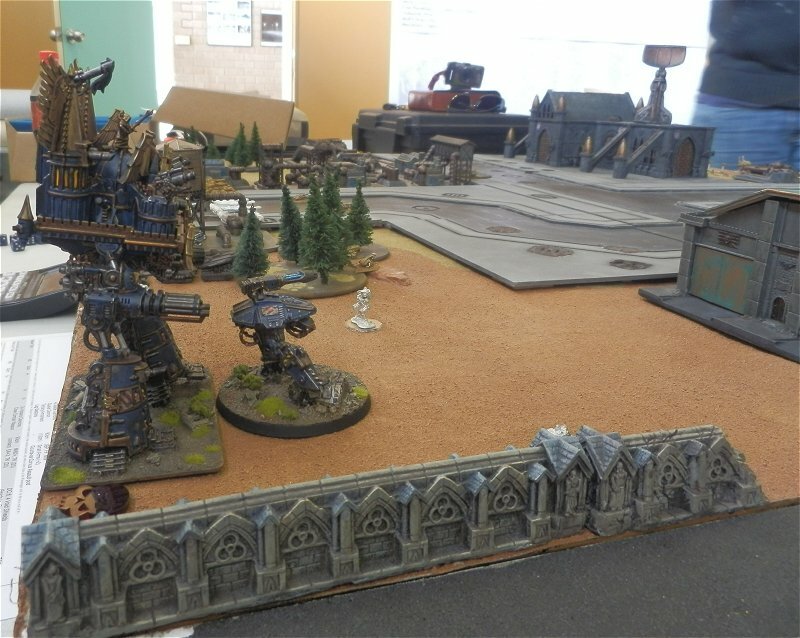 With the last activation of the turn, a Warhound doubles onto the Iron half of the board and contest an objective (the Iron Warriors were set to win at this point 2:0 with Defend the Flag and They Shall Not Pass). Onto turn 4. All Iron Warrior forces rally. All Minervan forces rally except the broken Warhound near the Ordinatus. 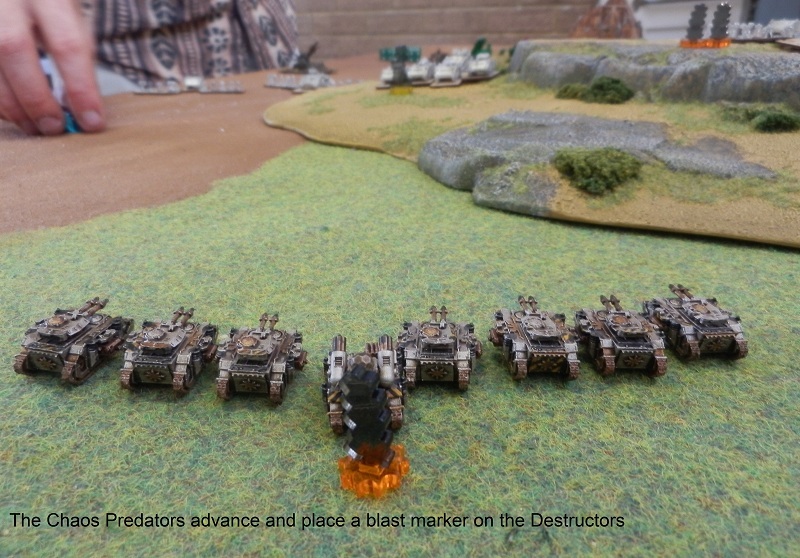 An Exterminator Tank Company engages the Chaos Predators and wipes them out, also placing a blast marker on the nearby Decimator. The Ordinatus sustains fire on the BTS Tank Company and breaks it. 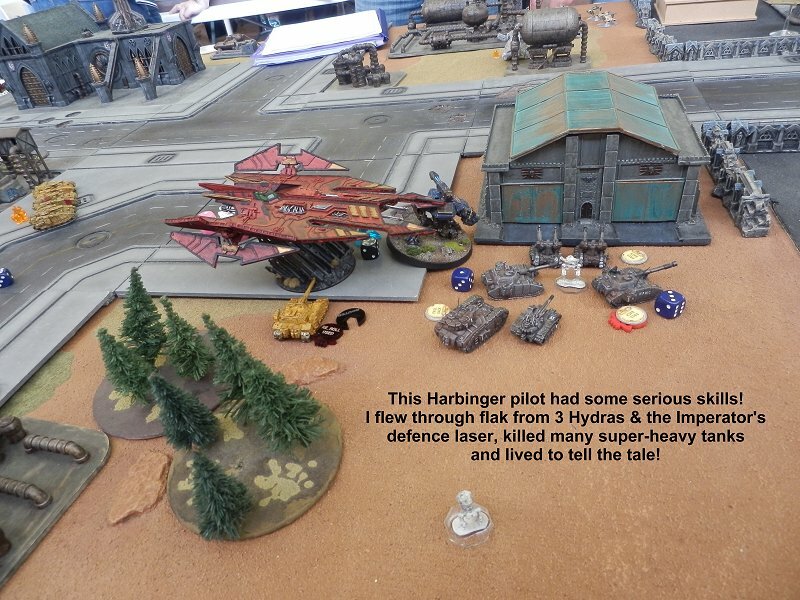 The Iron Warrior Havocs follow the broken BTS Tank Company and kills two tanks, causing a total of 5 Exterminators being destroyed. The lone (Fearless) Commissar tank remains close to a ruined building for cover. Warhounds break Defiler formations with relative ease. The Obliterators engage the Deathstrikes and wipe them out, placing a blast marker on the nearby Salamanders (the Salamanders are one blast marker off breakingas are the Obliterators). 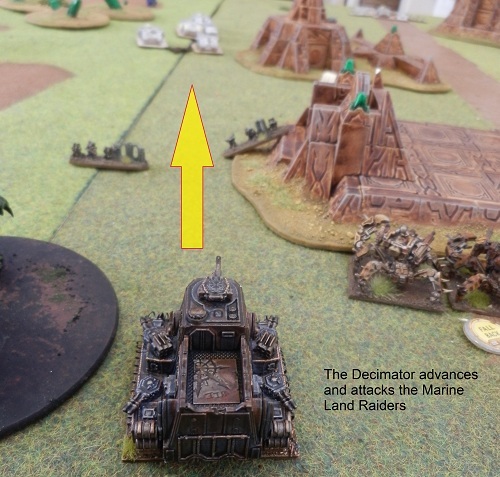 The Decimator opens fire on the remaining Tank Company and breaks it. The Salamanders pass their activation roll and break the Obliterators. 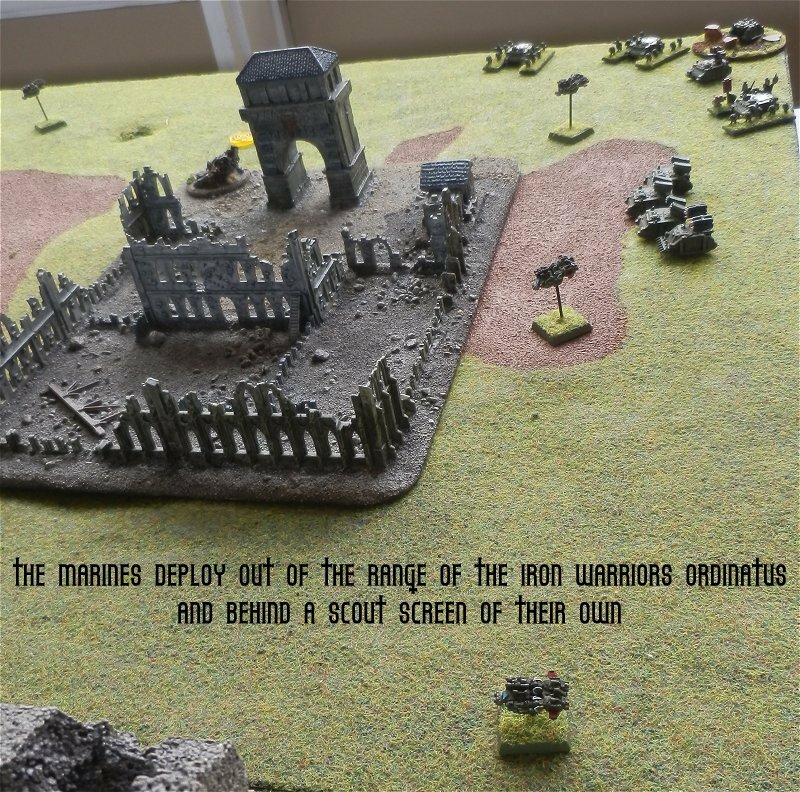 At this stage, The Iron Warriors had 4 formations on the Minervan half of the board. All were Fearless and all were broken. If one of them were to rally, the game would go to points. 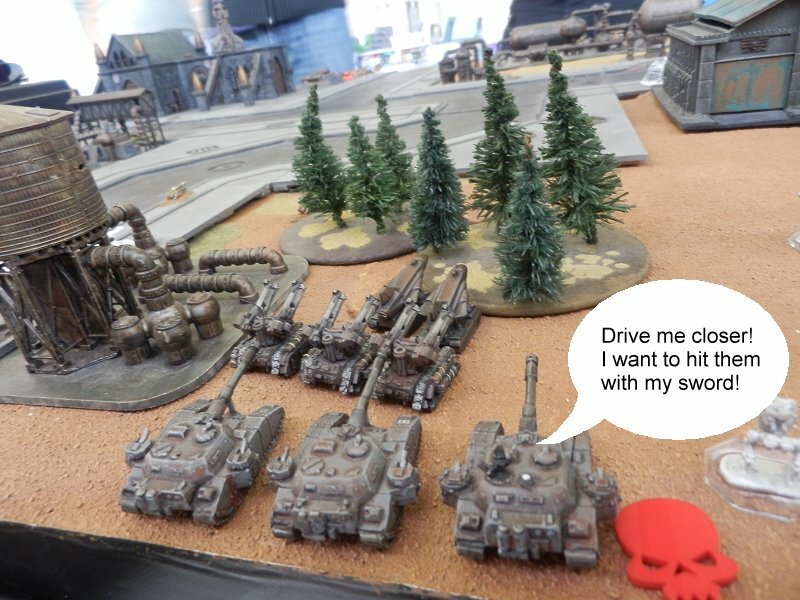 With both Minervan Tank Companies broken and near Chaos formations, the Iron Warriors were quite hopeful. 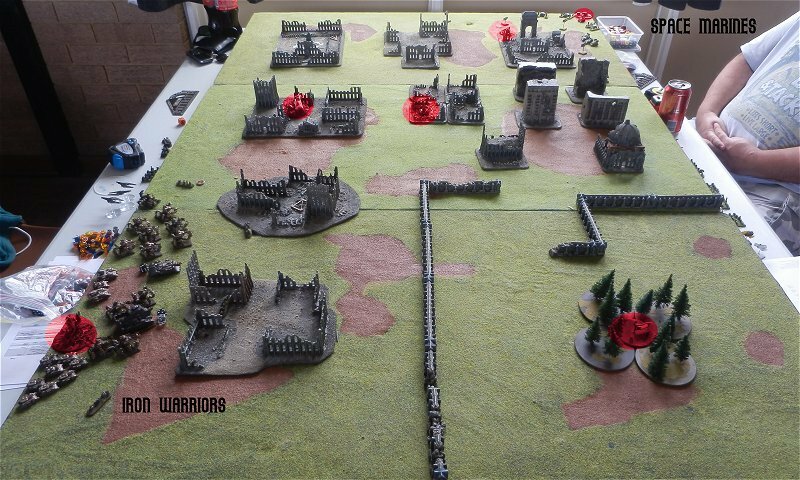 Unfortunately for the Iron Warriors, all four broken formations failed to rally and both Tank Companies successfully rallied. The game was won by the Minervans, MUCH to their surprise! 2:0 with Defend The Flag and They Shall Not Pass. A memorable and enlightening game. Many thanks Matt. Deployment on turn one (the Scout Marines in the bottom right had already moved before I took the photo). 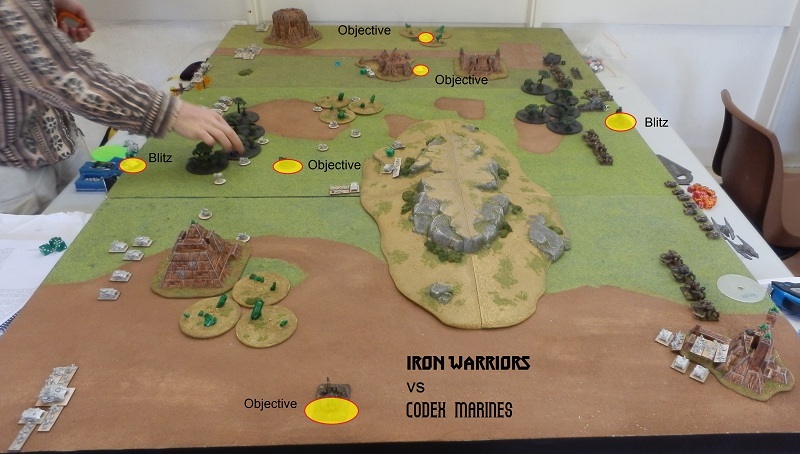 Strategy roll goes to the Marines – they give the Iron Warriors the first activation. 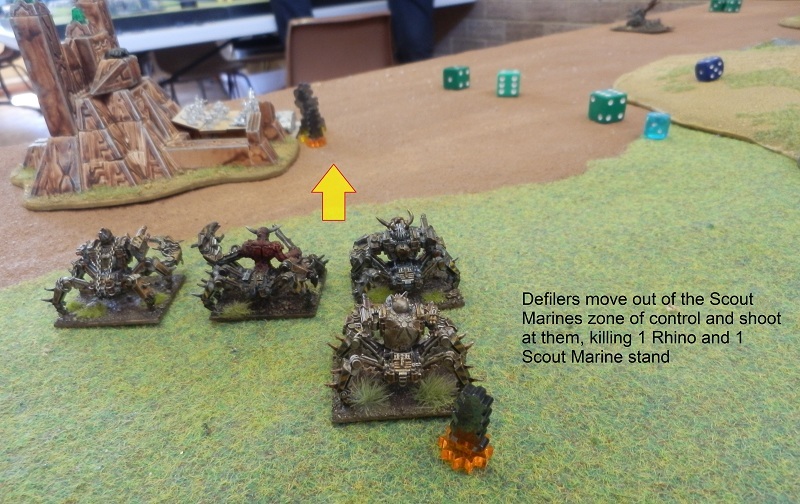 The Marine Devastator Detachment doubles forward and shoots the Defilers – killing 1 and breaking them. The broken Defilers move next to the hill in the middle of the board. The Chaos Hell Talons attack a Scout Marine formation. 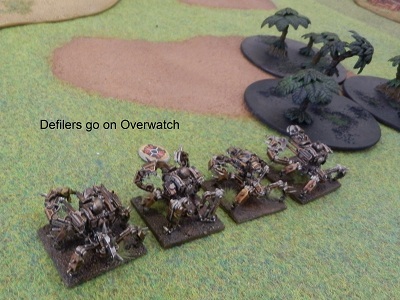 Retaining, a Defiler formation goes on Overwatch. Scout Marines retain and Engage the broken Defilers. They are hit by Overwatch fire and a Rhino is destroyed. The Scout Marines win the engagement killing a Defiler – the (Fearless) broken Defiler moves further across the board and hides behind a building. A Landspeeder formation doubles and catches the Chaos Predators in a crossfire – killing one of them. The other Landspeeder formation doubles and breaks the Chaos Predators. 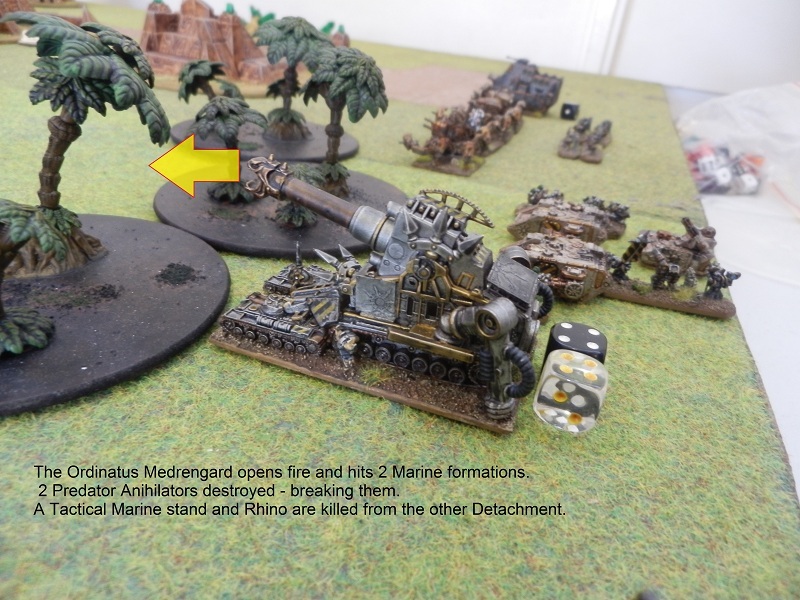 The Marine Land Raiders double forward – destroying two Defilers and breaking them. The Chaos Chosen Marines Advance. A Marine Tactical Formation doubles forwards and kills a stand of Chosen Chaos Marines. Vindicators March across the the board ready for turn 2. Tactical Marines Double along the road and open fire on the Decimator. The Helltalons are shot at by a Hunter as they withdraw which downs one of the planes. 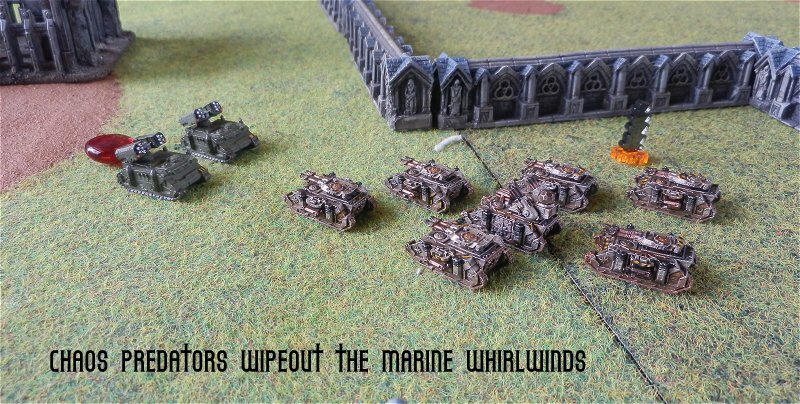 Marine Predator Annihilators fail to rally and pull back towards the Marine Blitz objective. The single Broken Defiler fails to rally. All other Iron Warrior formations rally. Things are looking bad for the Chaos forces as they’ve been pushed back with the Marines in good position for turn 2. 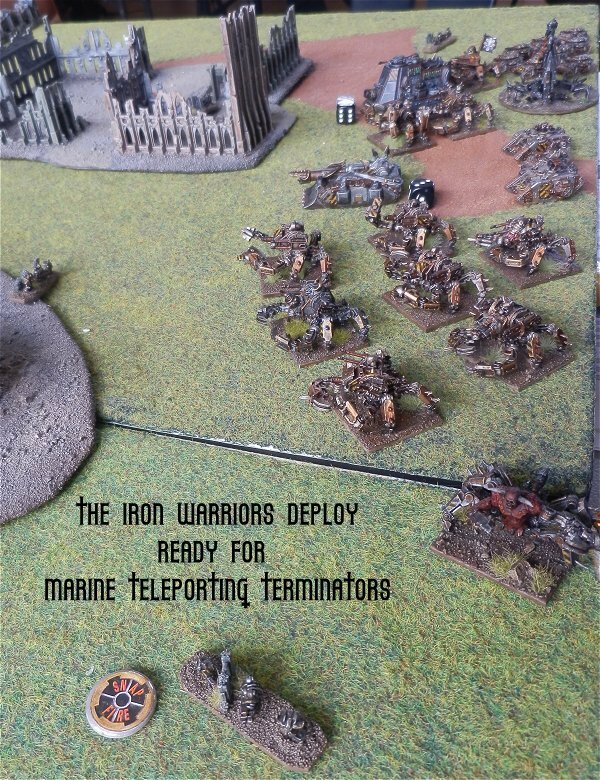 Iron Warrior Terminators Teleport in near the Marine Blitz objective. Strategy roll goes to the Marines. The Vindicators double towards the Chaos Blitz and strip 2 Void shields off the Ordinatus (also moving into a great position to support an engagement against two intermingled Chaos formations). The Marines attempt to retain on a 2+ to engage the Intermingled Defilers and Decimator but roll a 1. The Marine Predator Destructors moved into position to support another intermingled engagement. 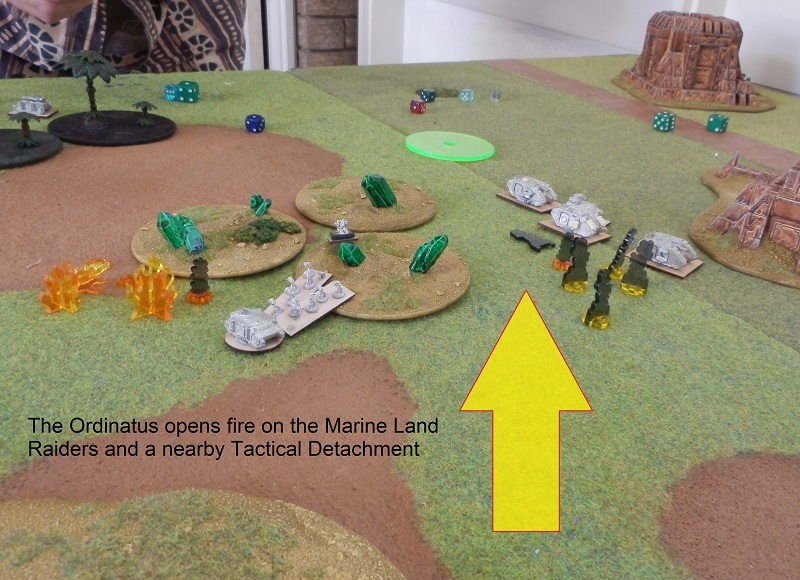 Unfortunately, the Marines rolled another 1 when trying to retain with Landspeeders (fortune was shinning on the Chaos forces and gave them a chance to turn the tide of the battle). 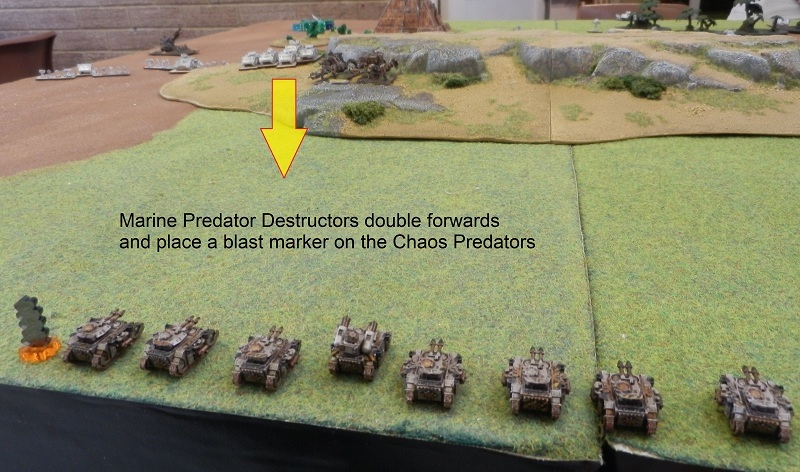 The Devastator Detachment doubles and places a blast marker on the Chaos Predators. The Chaos Predators double and attack a Scout Marine Detachment. 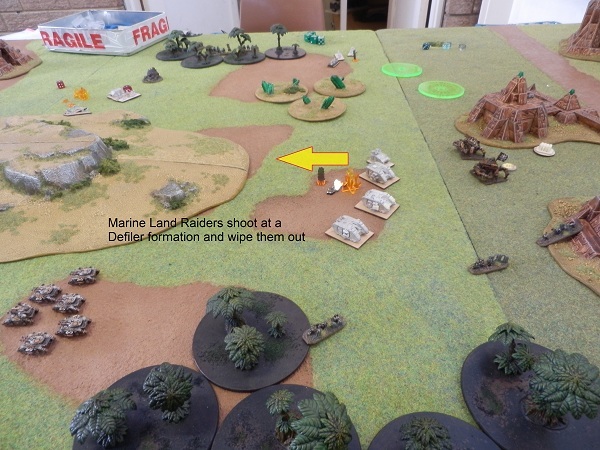 Another Marine Scout Detachment fails to activate and makes a single move. 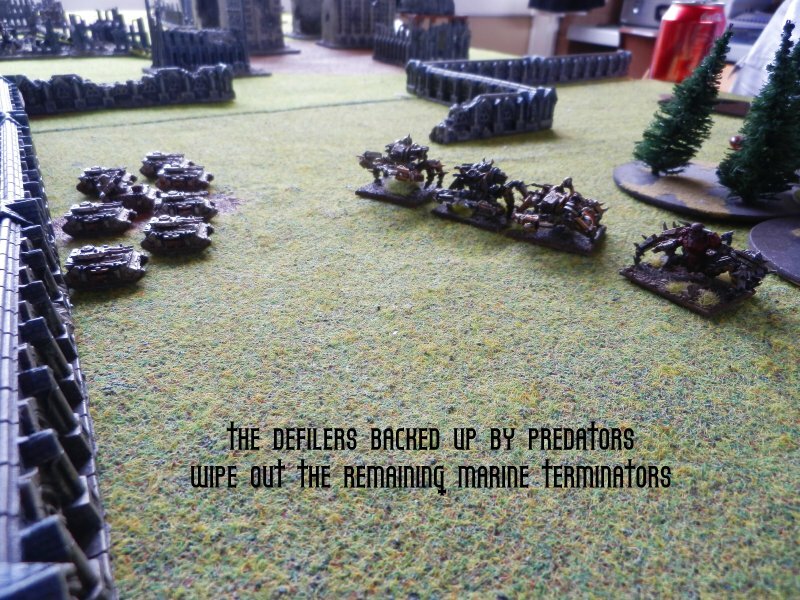 Defilers engage the Vindicators in close combat and kill 2 of them and break them. The Marine Land Raiders Marshall and place another blast marker on some Defilers. 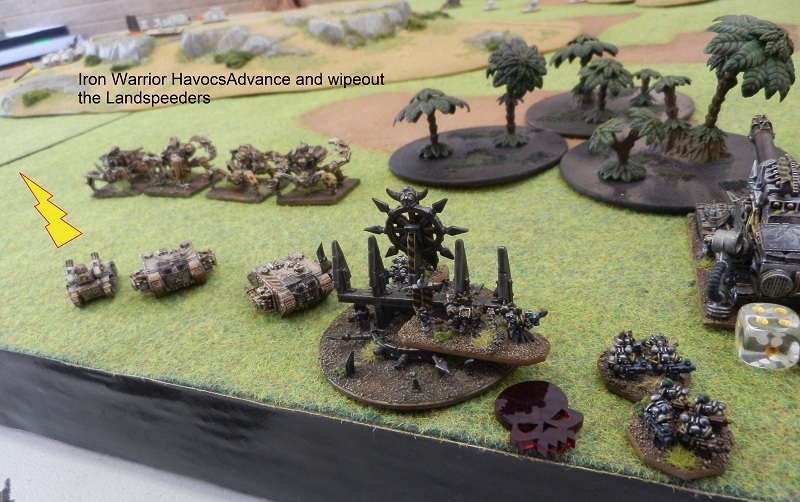 Havocs Sustain fire on the Land Speeders and wipe them out. 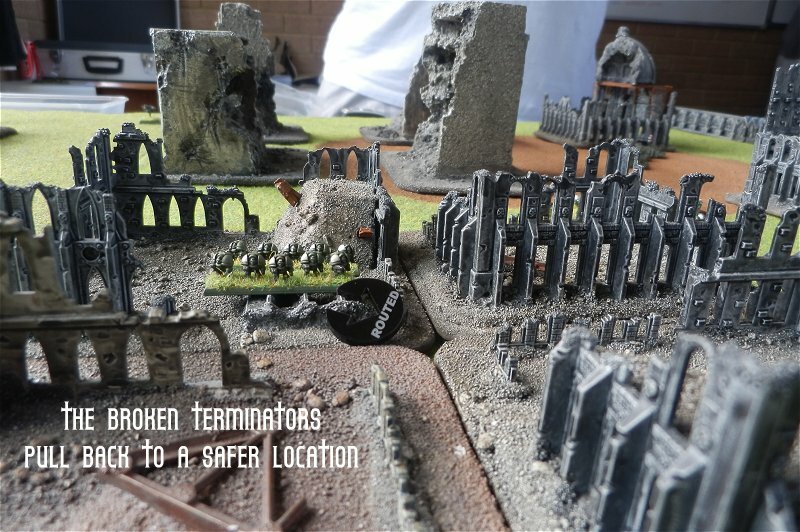 The Terminators Engage the nearby broken Predators and destroy them, consolidating back into cover (near the Marine Blitz objective). 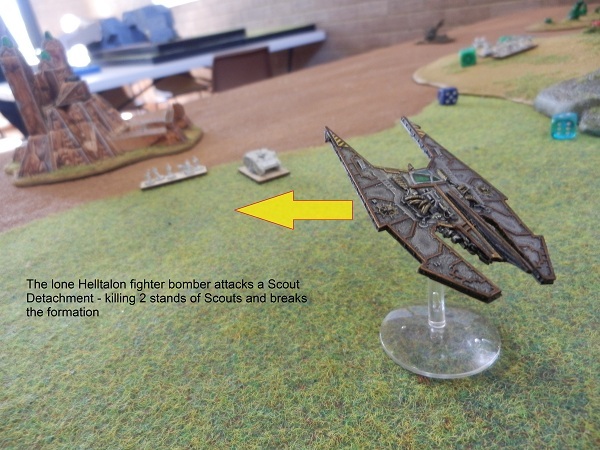 The lone Helltalon fails to activate. The Marine Vindicators don’t rally. All other Marine formations rally. Turn 2 had seen the Iron Warriors break through the Marine lines (with some very good fortune it must be said). 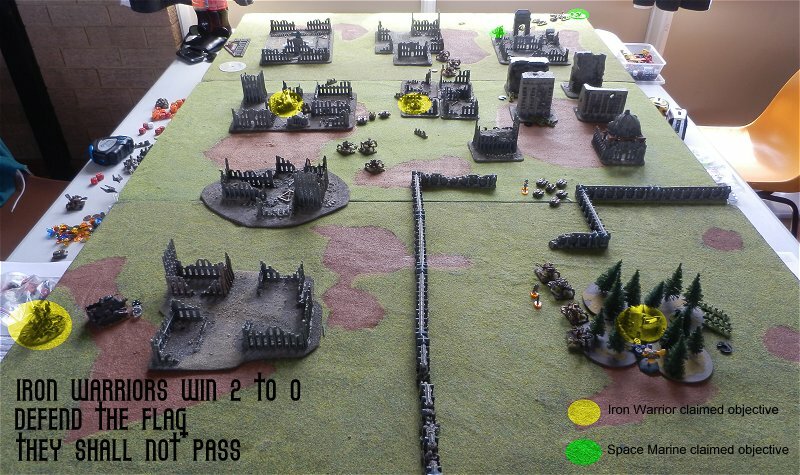 Iron Warriors win the strategy roll. The Havocs sustain fire on the Predator Destructors and break them. 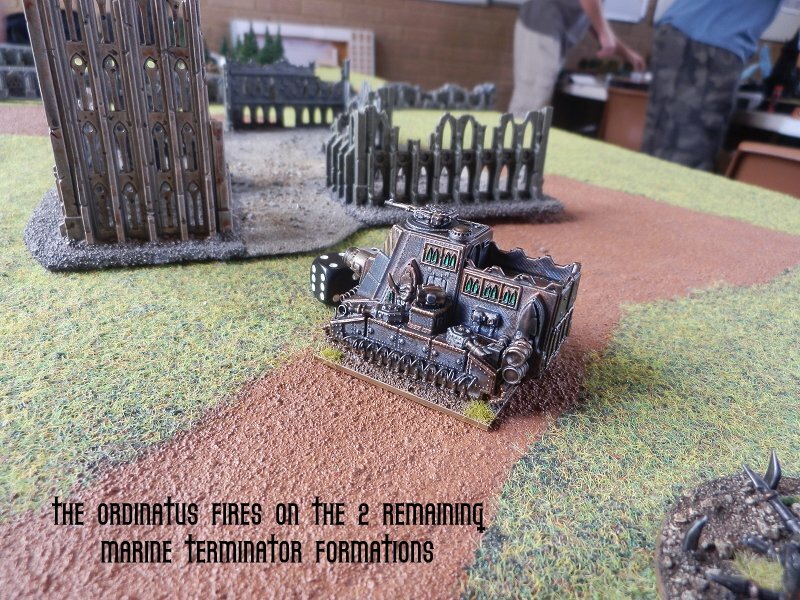 Retaining, the Chaos Predators sustain fire on the Devastator Detachment and break it. The Marines finally get to make the intermingled Engagement on the Defilers and Decimator. The Decimator is destroyed and the Marines win the assault. 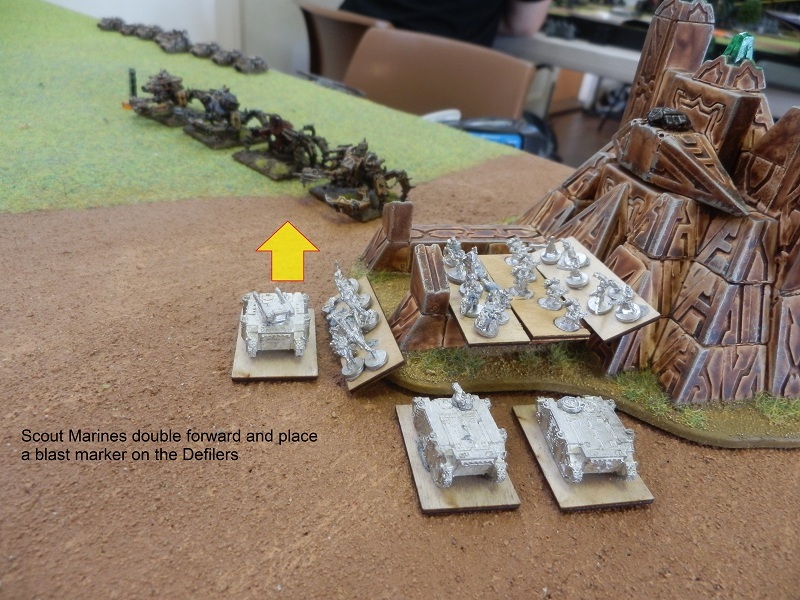 The broken Defilers move in between the Land Raiders and the nearest objective. Unfortunately the Marines cannot consolidate onto any nearby objectives. The Ordinatus sustains fire on a Scout Detachment placing many blast markers but not breaking the formation. The Scout Detachment moves onto an objective. The Chosen Marines place a blast marker on the Marine Land Raiders. 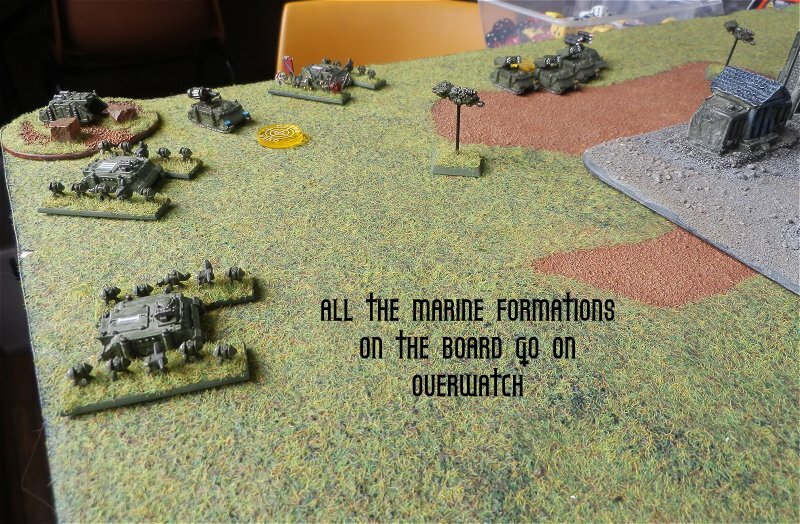 Unfortunately, the last Marine formation (a battered Tactical Detachment) fails to activate and makes a single 15cm move. 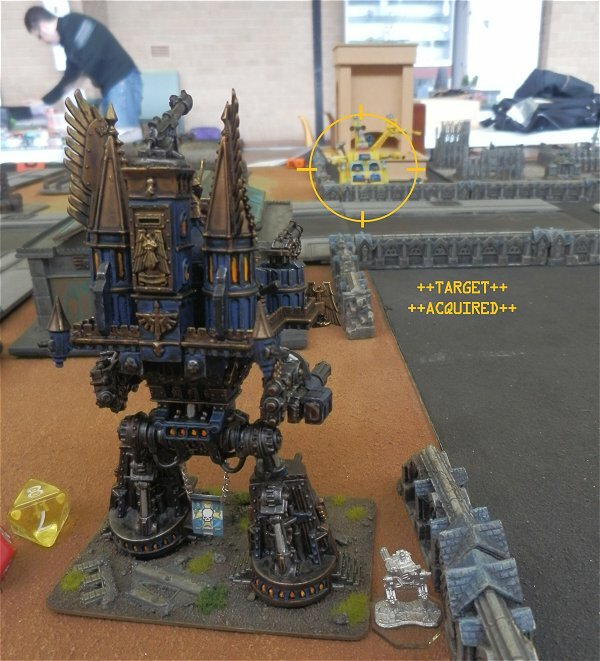 The Iron Warrior Terminators move onto the Marine Blitz to claim it. The lone Defiler doubles over to another objective on the Marine side of the board to claim it. A really interesting game with a big swing in the fortunes of each army. Many thanks to Glyn (and commiserations for appalling dice rolls in turn 2 which shaped the outcome). Frosthammer and I managed to get a couple of test games for our developmental armies. 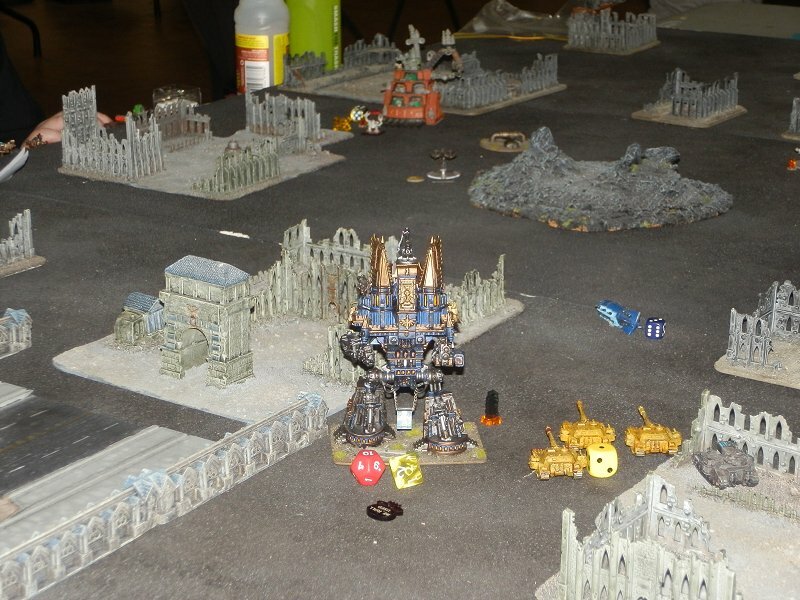 My Iron Iron Warriors (using V2) took on the Raptor Space Marines (using the Codex Astartes list). The board at the beginning of the game. The Raptors had chosen corner deployment. 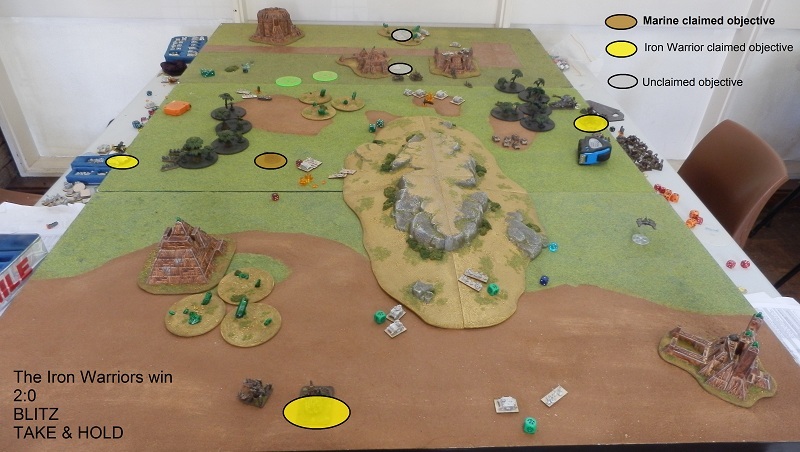 Marines win the Strategy Roll and place one of the Thunderbolt Squadrons on CAP. 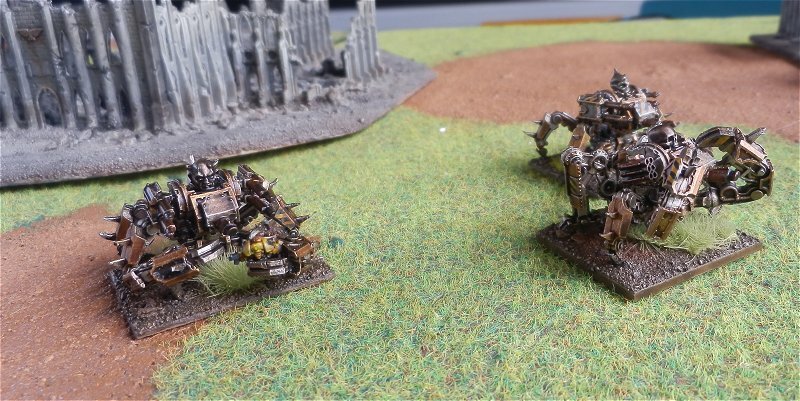 The Iron Warriors move forward cautiously. Imperial Navy Thunderbolts attack the Chosen Scout formation destroying a stand and placing 2 blast markers. The Thunderbolts are shot at (by the Ordinatus) during their disengagement move and one is destroyed. All Iron Warrior formations rally. Marines win the strategy roll. The lone Thunderbolt fails to activate and stands down (clearing it’s BM’s). The Chaos Hellblade fighters go on CAP. Seeing the Iron Warriors begin to head for the objectives, the Thunderhawk drops it’s load of Devastators and Dreadnoughts on the objective in the woods. 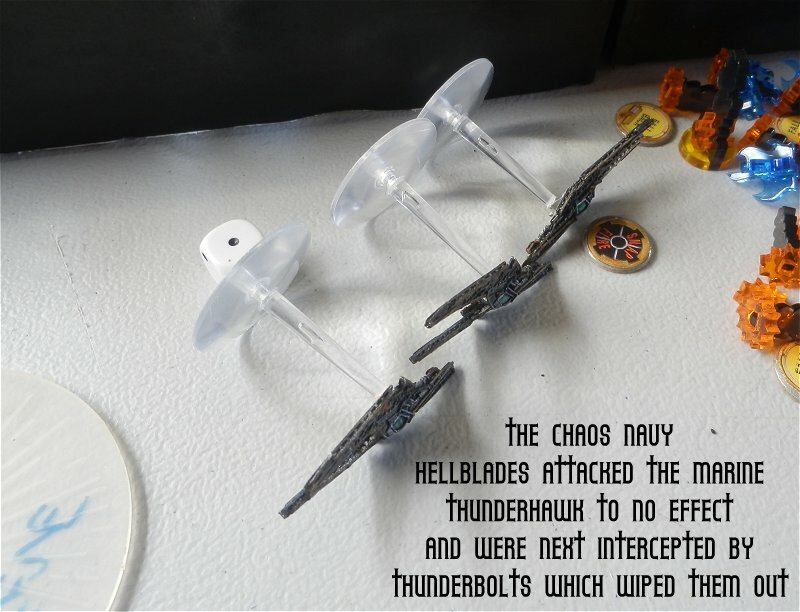 The Hellblades CAP the Thunderhawk but do no damage for the loss of 1 fighter. 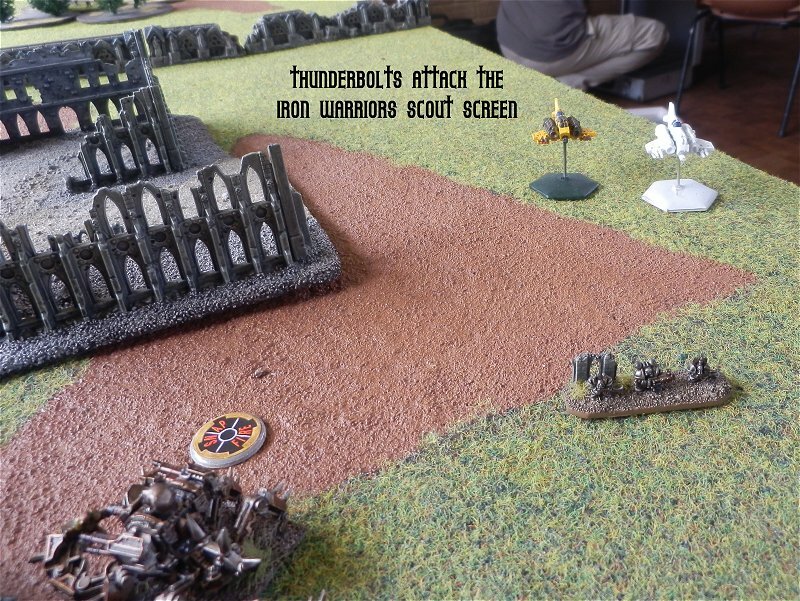 The Iron Warrior Chosen formation moves to keep a scout screen around the Ordinatus. The Marine Whirlwinds advanced to get into a better position for turn 3. 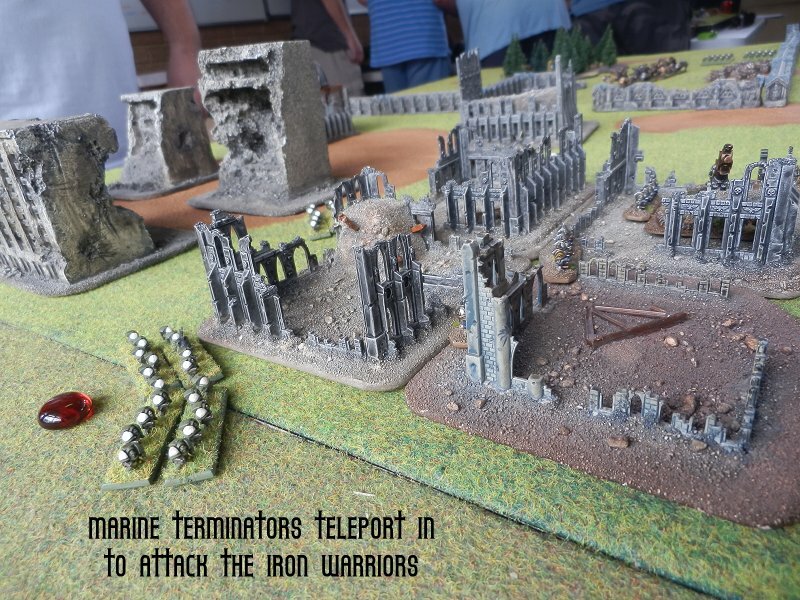 Iron Warrior Terminators teleport into the center of the board on top of an objective. 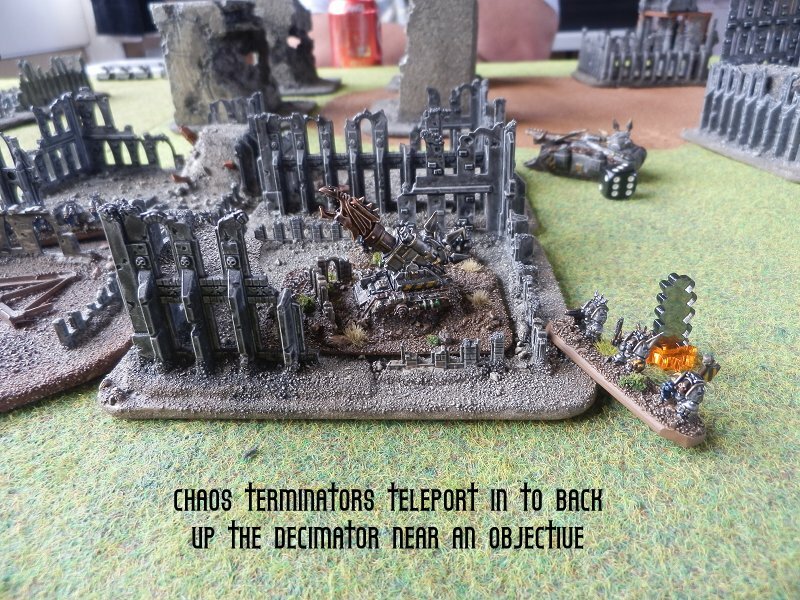 2 detachments of Marine Terminators teleport in near the Chaos Terminators and Decimator. Another detachment of Marine Terminators teleport in near the Chaos Predators and Defilers. Marine Terminators wipe out the Chaos Terminators. 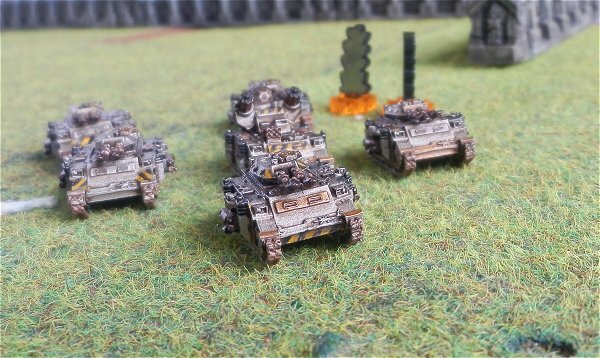 Retaining the initiative, more Marine Terminators engage the Decimator super-heavy tank and destroy it. Chaos Defilers move to firefight the un-activated Marine Terminators. With supporting fire from the Predators, the Marine Terminators are wiped out for no loss. 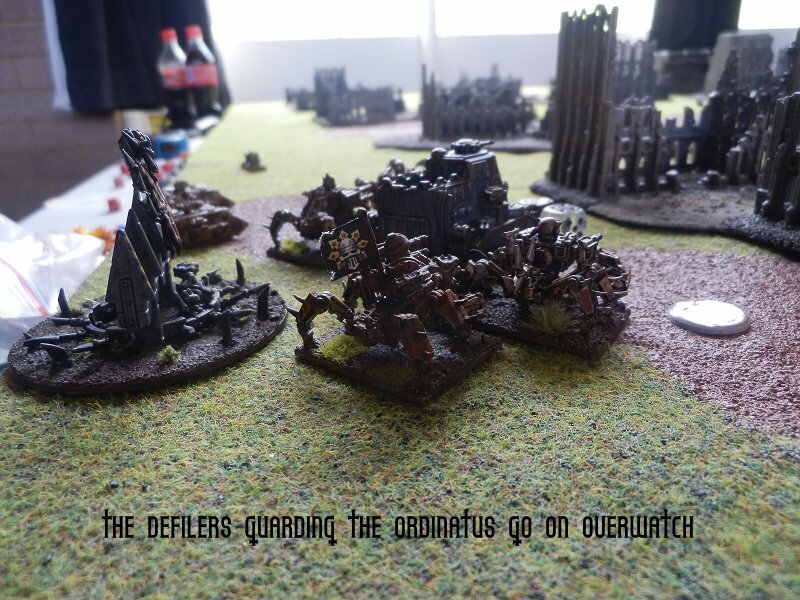 The Defilers consolidate onto the nearby objective being guarded by the Devastators. 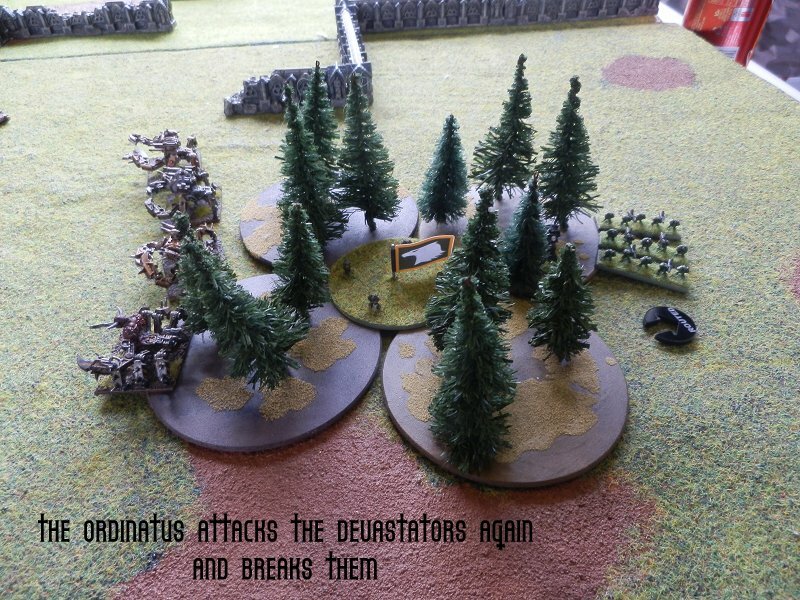 The Ordinatus opens fire on the Devastators in the woods and kills several stands, breaking the formation. 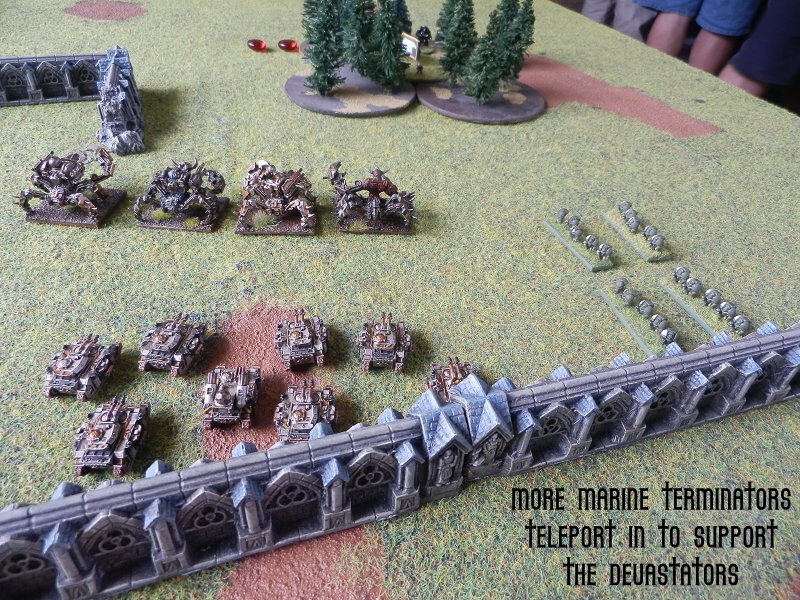 The Marine Land Speeders double across the board and attack a Defiler formation, placing a blast marker. 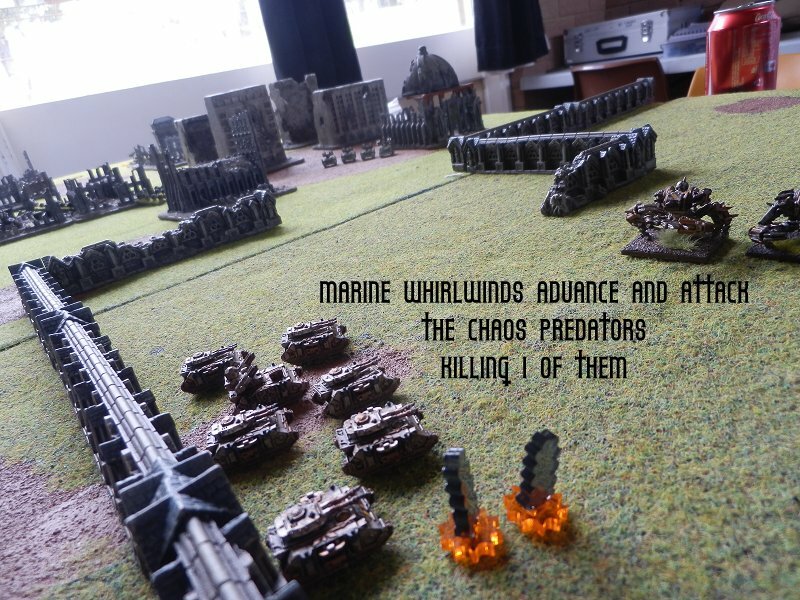 The Iron Warrior Predators advance on the Whirlwinds and destroy 2 of them. 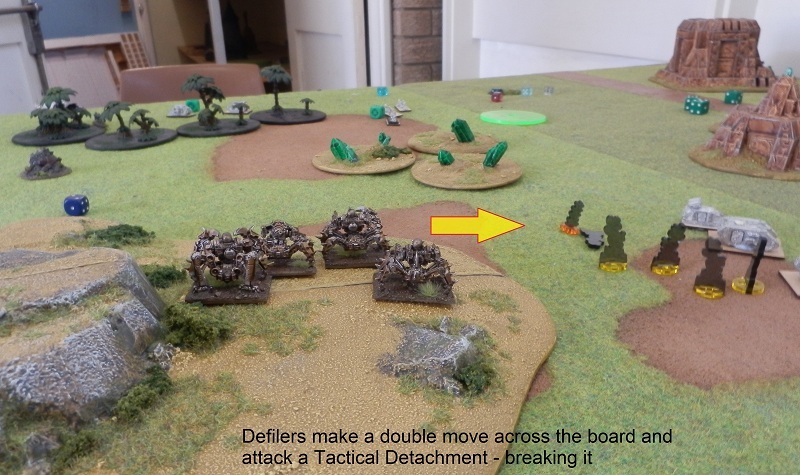 Thunderbolts ground attack the Defilers and kill 1 of them, breaking the formation. The Iron Warrior Havocs (and Warsmith) and Defilers double forwards now that the Terminators are all in play. They had been guarding the Ordinatus from Terminator assaults. At the end of turn 3, the Iron Warriors have 1 Victory Goal (Defend the Flag) to the Marines none. Onto turn 4. Fortune smiled on the Iron Warriors and they took advantage. Thunderbolts strafe the Defilers holding the objective in the woods but only place a blast marker. The Havocs advance on the Land Speeders and destroy them. 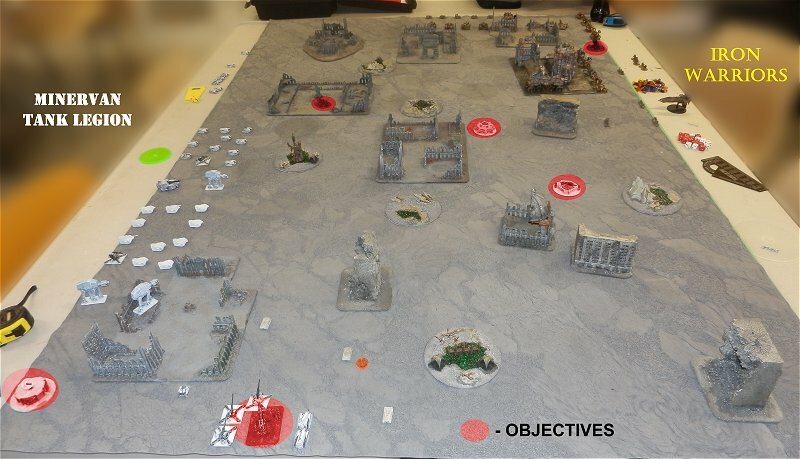 They spread out to claim 2 objectives. The Marine Tactical detachment goes on Overwatch to deter any advance on the Marine objectives they are guarding. At the end of turn 4, the Iron Warriors have 2 Victory Goals (Defend the Flag and They Shall Not Pass) to none. 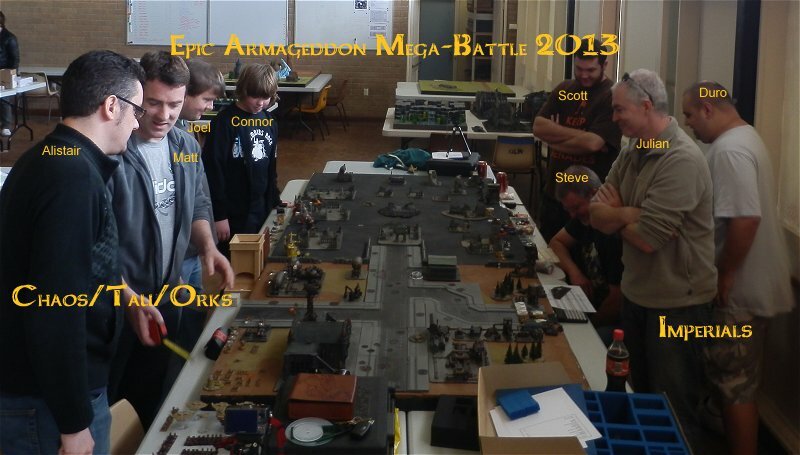 22nd September 2013, 8 local players (from Perth) got together to have a big fun game of Epic Armageddon. There were 12,000pts on each team. 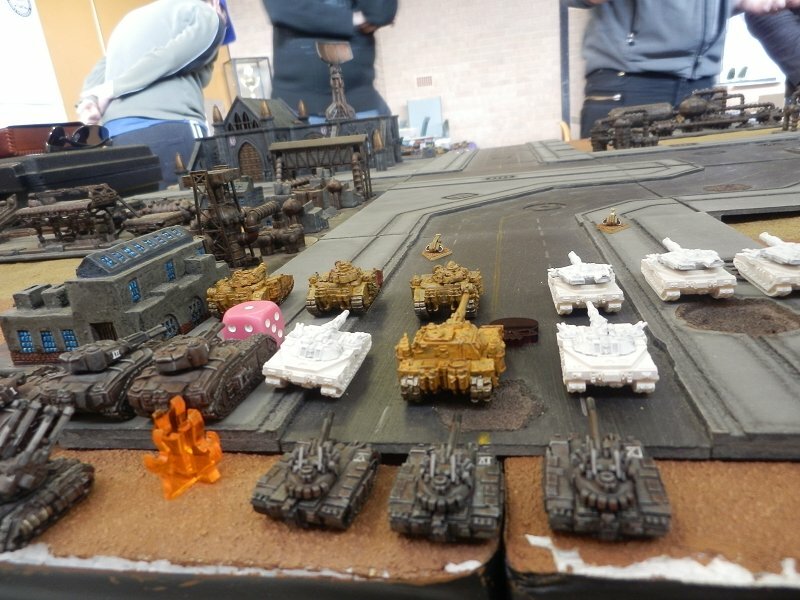 One team consisted of 2 Minervan Tank Legions, a Titan Legion and Squat allies. The other team had Red Corsair Chaos Marines, Tau and 2 Gargant mobs. These are just a few photos of the game. The game ended on turn 3 with a slight victory to the Imperials – 1:0 (Break Their Spirit). Fun day as always!